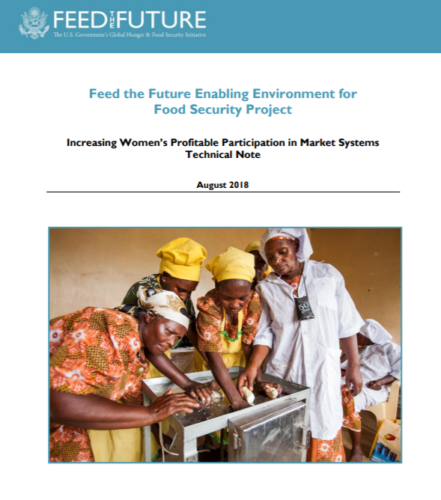 The Feed the Future Enabling Environment for Food Security Project resource “Increasing Women’s Profitable Participation in Market Systems Technical Note” was developed by Fintrac and Cultural Practice, LLC and published in September 2018. This note examines the role of the enabling environment in supporting women agri-entrepreneurs and agricultural wage workers. It first briefly describes the entrepreneurial and employment actors that characterize an inclusive agricultural sector. The following section explores the different types of policies that positively (or negatively) influence the participation and performance of women entrepreneurs and wage workers and the benefits they receive from their involvement. After the review of the current evidence, the note looks ahead to raise some emerging issues and identify concrete steps that can be supported through policy options. Access the note on the AgriLinks website.